During the research effort while writing AtG I had the extreme fortune to have Duncan Head's assistance at times. When I was stumped, he graciously helped me with any query, and has given permission to reposte this letter here on the web. Duncan is of course the author of the premier work on the Armies of the Macedonian and Punic Wars, a Wargames Research Group Publication illustrated by Ian Heath, and the excellent source on the Achaemenid Persian Army printed by Montvert Publciations (currently out of print). The issue of the strength anf armament of Darius' kadakes troops is really the key to determining the OOB of the battle. I hope this material allows the reader to understand the judgements made to recreate the battle and OOB, and the statlines in AtG. Duncan's evaluation of the comparative strengths given by different sources is an invaluable exercise, and I post it here so that the reader can use the material to come to their own conclusions. I have added notes since some of the comments are directed to DBx gamers, there I have tried to translate the comments into the equally arcane "WAB speak". Armies of the Macedonian and Punic Wars is referred to as AMPW. Thanks to Duncan, and enjoy! Ah, have you not read the Montvert Persian book? I address this issue there. Basically I don't think that Alexander did charge headlong into the kardakes, so the problem doesn't arise. - (Cornelius) Nepos' Life of Datames mentions kardakes serving in the army, armament unspecified but also "slingers of the same origin"
- Curtius describes two separate bodies of infantry, one of 20,000 "barbarians" and one of 40,000, both apparently to the left of the Greeks. Since Curtius' two bodies add up to 60,000, they match Arrian's kardakes in numbers and Kallisthenes' peltasts in position. This is the key to resolving the problem. Both Arrian's and Kallisthenes' testimonies go back to eye-witnesses and it seems unlikely that any Greek would mistake hoplites for peltasts, or vice versa. Therefore, I suggest there were two bodies of infantry, not one; one force (probably the 40,000, though it's hard to be sure) armed as peltasts, the other as kardakes hoplites. Alexander would have charged the peltasts. (Given that the Nepos quote suggests there may have been such a thing as kardakes slingers, "kardakes" may mean an origin rather than a style of armament, so it is conceivable that the peltasts were "kardakes" too.) Sekunda takes the "barbarian" bit of Curtius' description to mean non-Persian as well as non-Greek, which is partly why he thinks that the kardakes were new "barbarian" mercenary regiments. At Issos, we hear of infantry called kardakes whose armament and origin has caused confusion. Arrian explicitly describes them as hoplites, which would imply large shields and possibly armour, similar to the reorganised Persian Guards' equipment. But Polybios quotes the contemporary Kallisthenes as describing peltasts; while Xenophon used "kardakes" to mean an unpaid training corps of Persian young men, who served as police, and accompanied the King on hunts. Their traditional training involved javelins, light shields and bows, implying that they were light troops or at best peltasts. But where both Arrian and Kallisthenes mention only one type of infantry, Curtius' account of Issos has two separate units, who add up to the same (possibly exaggerated) 60,000 as Arrian's kardakes. The likely solution is that (as Duncan Head has suggested in The Achaaemenid Persian Army) there were two separate forces present, one of kardakes equipped as hoplites and the other of peltasts. 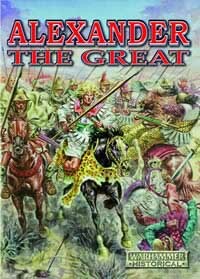 Alexander's headlong frontal charge into their ranks would have been directed at the peltasts. Whether these kardakes were the Persian youth corps called out by Darius to bolster the army, or a different force entirely, is uncertain. Ah, hold it: I've just found my description of the kardakes, quoted from the Persian book, in an email I did on the OOB at Issos for someone on dbmlist. I'll attach it. The most enigmatic of the later Persian infantry troops are the kardakes mentioned in several sources. There is no general agreement on their status or tactical role, and several interpretations have been proposed. Strabo says that Persian youths undergoing military training (as described in "Persian military training", above) were called kardakes "for karda means the manly and warlike spirit" (XV.3.18). Another possible meaning for kardakes is "Kurdish" - Xenophon calls the Kurds Kardouchoi, and Lukshu the mercenary Kardaka has been mentioned above; so the kardakes in Achaemenid armies have sometimes been identified as Kurdish mercenary troops. Bodies of troops called kardakes occur in two fourth-century armies. Autophradates in 367 had 100,000 kardakes and 3,000 slingers "of the same kind" (Nepos, Datames VIII.1). At the battle of Issos, Arrian (II.8) says that Darius III supported his Greek mercenaries with "60,000 Persian hoplites, called kardakes, half on each of their flanks". This is our only specific reference to the kardakes' equipment. But Polybios, discussing the account of Issos given by the contemporary writer Kallisthenes, says (XII.17.7) says that the mercenaries were drawn up with peltasts next to them, in a line reaching to the hills. This is usually taken to imply, in contradiction to Arrian, that the kardakes were peltasts. Most scholars have simply assumed that one author or other is wrong, and J F C Fuller's suggestion (The Generalship of Alexander the Great, 1958) that they must have been peltasts, since otherwise Alexander would not have charged them frontally with cavalry, has been the most influential. As an alternative, I have previously suggested (Head, 1982 [that is, AMPW]) that their equipment might have conformed exactly neither to the Greek idea of a hoplite nor to that of a peltast. There is no agreement on the size of the Persian army at Issos, nor any really convincing full list of units. Arrian and Plutarch claim 600,000 men; Diodoros 400,000 foot and 100.000 horse; Curtius 250,000. Arrian (II.8) and Curtius (III.9.1-6, and III.2.1-9) give the most detailed breakdowns. Darius sends 30,000 mounted and 20,000 light infantry across the river to cover his deployment. 30,000 Greek mercenaries opposite the Macedonian infantry, with 60,000 Persian kardakes hoplites half on each of their flanks. These are all the troops the ground will allow. On the hills, to their left, another division about 20,000 strong, some of which actually worked round to Alexanders rear. Behind the Greeks and kardakes a great mass of light and heavy infantry drawn up too deep to be of much use. Darius then recalls the troops across the river, and sends most of them to his right by the sea - nearly all the Persian cavalry end up there. Although the numbers look exaggerated, there is quite a high degree of correspondence between the two accounts - even though Arrian and Curtius did not always use the same sources. **Other contingents were deployed behind the main line, but neither writer identifies them: they look like good candidates for DBM Hd (O) filler. - Arrian says that at least 8,000 Greeks survived the battle, so there were probably 10,000 at least to start with, and perhaps not many more. Frontages give you an important guide: roughly, the Persian right-wing cavalry matched the Greek allied and Thessalian cavalry, while the Greeks and kardakes matched the phalanx - six 2,000-man taxeis (to follow Lukes arguments, rather than the more usually-stated 1,500) plus 2,000 or 3,000 hypaspists, drawn up eight deep. The Persian peltasts to the left of their hoplite-phalanx were probably opposite Alexanders Companions. Their left-wing troops outreached his right. Therefore, the frontage of the Macedonian phalanx - assuming your OOBs are at the correct rules scale of about 1 element per 250 men, reduce accordingly if youre scaling the Macedonians down - would be 28-30 elements (14-15,000 at 250 per element, 2 elements deep). If you assume that the line of Greeks plus kardakes-hoplites matches the frontage of the Macedonian phalanx then Greeks and kardakes will also have a total frontage of about 30 elements (perhaps 20 Greeks and 10 kardakes), or a total strength of 60 if they were also deployed eight ranks/two elements deep (they may very well have been deeper, 12 and 16 are common 4th-century hoplite depths). - then you get a total of 40 elements of Greeks and 26 elements of kardakes, giving you - if you assume theyre eight ranks, or two elements,deep - a frontage of 28! I would start the operation from here, but note that if you change any of the assumptions - like assuming that Arrian is correct and there were twice as many kardakes hoplites as Greeks - then your answers will change accordingly. I would probably limit the Persians to two commands - Darius and Nabarzanes. Note that Curtius speaks of a main division into two, right and left with no mention of a centre, although he does mention two other commanders. Two generals would make Persian command suitably clumsier than the Macedonian. In particular Im concerned that the far left sub-division under Aristomedes would manage to swamp the outnumbered Macedonian right if it had its own general. If its part of Darius command, then in the first few bounds when the rest of the Persians are just standing behind the river, the left may get enough PIPs to work some troops round the Macedonian flank, as happened. But hopefully later, with the main Persian line engaged, they wont get the PIPs to exploit it. The disadvantage with this is that putting the Persians in two big commands is going to make those commands hard to break.